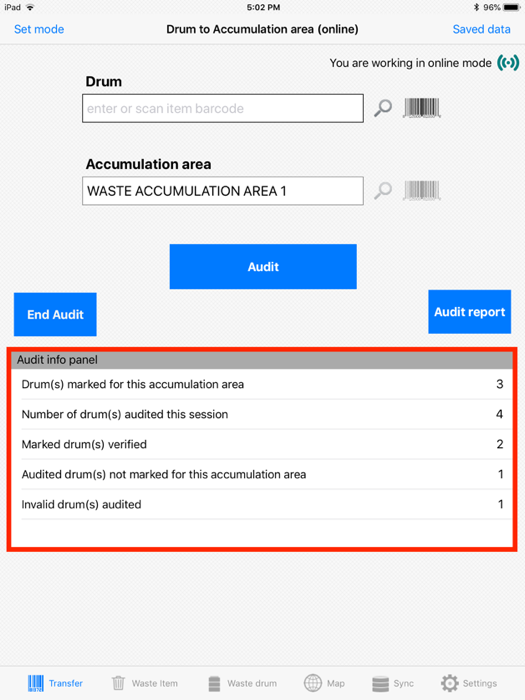 Chemical Safety’s EMS Waste module allows users to Audit an Accumulation Area to ensure that there are no mistakes between the items that are marked there within the system and the items that are actually in the area. Once the system has been refreshed after wastes have been transferred to an accumulation area, an employee can audit that area to record its contents. The new function of the Waste Mobile Application will allow the user to do this on-site and in real-time. The ‘Info Panel’ is the most important part of this functional update to the application. The info panel displays the contents of the accumulation area and relays the items marked or not marked for the intended area. The user will on by one scan the barcodes of the drums or items inside the accumulation area. This will update the ‘Info Panel’ so that the user will be informed upon the amount and appropriateness of the contents. Before completing the audit, the user will be able to run a report of the audit, so to supply it to all responsible employees. With Chemical Safety’s EMS software, you have the ability to build and add, on your own and as often as you like, audit and inspection questionnaires using the EMS Audit Builder software. The EMS Audit module is designed to facilitate entities in managing inspection and audit-related activities. It supports end-to-end functionalities for ensuring a complete audit lifecycle, from scheduling and developing audit plans to monitoring and analyzing results.